Today, the internet has become a huge part of our lives and has dramatically changed the way we purchase goods and services. A website allows customers to freely access your business information at any time of the day and has a huge effect on swaying buyer opinions. It’s a progressive tool that needs to stay fluid and adapt – exactly like your business. Using the latest technologies, we create professional websites that sell, while keeping you in total control. If you’re not taking advantage of the web then you’re falling behind, so call us now and do something about it. Our award-winning designer will make sure you get a website you’ll love, and so will your target market. Whether you need a website, logo, business card, letterhead, flyers, or print media designed; we do it all. Image is everything in today’s business environment, so make sure you get the professionals to create your corporate identity the right way. Just take a look at the projects we've done. 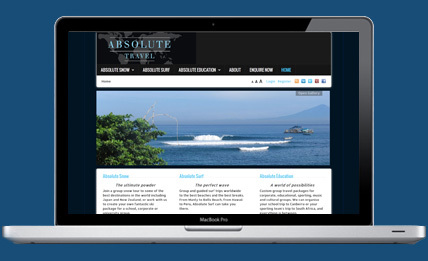 Licensed travel agent, Absolute Travel, specialises in surf and snow holiday packages and needed assistant launching their marketing packages at the beginning of the snow season. We created a flyer based on their specifications and included it in an electronic mail out (known as an EDM). They had instant success and a number of clients booked a holiday a week later. 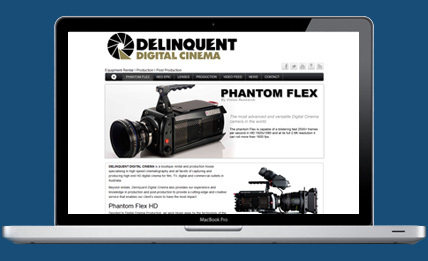 Boutique video camera rental and production house, Delinquent Digital Cinema, needed to enhance their online presence and get found on Google. We based their SEO campaign around their unique selling point: the Phantom Flex – a high speed camera which only a handful of companies in Australia rent out to the public. We also optimised the site for another camera they rent: the Red Epic – a more common high speed camera. The results speak for themselves. Delinquent Digital Cinema are on the first page of Google for the terms 'Rent Phantom Flex' and 'Rent Red Epic Sydney'. 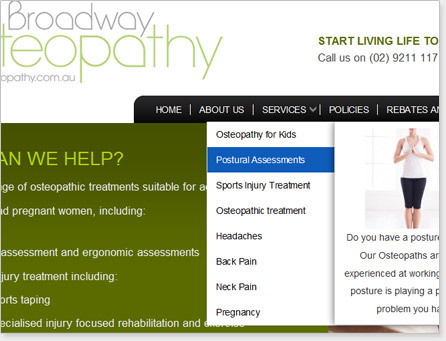 Professional healthcare professional, Eddie Clark, runs an osteopath business in inner West Sydney area, at Broadway. Initially, the website was a collaborative effort with Benjamin Tuffy – Tuffy did the design and I did development work. However, the client wanted to take full advantage of online marketing so a Search Engine Optimisation (SEO) strategy was devised and implemented. Both organic and paid results are consistently scrutinised and new SEO methods and targets are developed based on previous results. Also, a client feedback system was implemented to track results and measure the success rate of the digital efforts. Social media was also integrated. 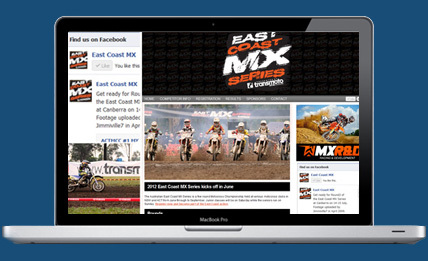 The East Coast Motocross Series is an all-new motocross series beginning in 2012, and sponsored by Transmoto Dirt Bike Magazine. The client needed a brochure-based website they could update on the fly, with social media integrated into the experience – through the Facebook page box and Like button. Once again using WordPress as the CMS, the client can now happily make all the changes they want. Completely revamping their old website, Benjamin Tuffy took a modern approach to this design, with the adage ‘less is more’. Along with the updated graphics, the client wanted a package that would allow them to make updates, so WordPress was used to drive the site. Sponsor’s advertising was a requirement so it was installed and controlled through Google's DoubleClick network. Creative Art Director, Benjamin Tuffy, was seeking an online portfolio that would allow his work to shine and be easy to update at any time. Having collaborated with Tuffy on a number of previous projects, we designed and developed Benjamintuffy.com using WordPress as the core development technology. 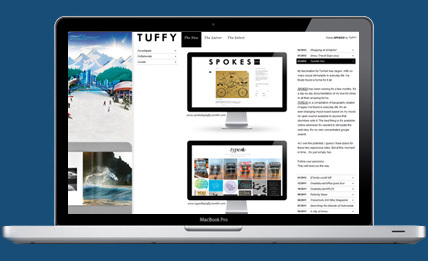 Combining a number of development techniques allowed for rich media content – including the rapid development technology, jQuery, and secure PDF viewer, Issuu – that creates a truly unique environment for Tuffy’s designs to flourish. Local Northern Beaches Newport Board Riders Club were seeking a website to allow club members to stay up-to-date about competition draw, results, pictures and upcoming events. Integrating technologies from online Australia surf camera website, Coastalwatch, was a major part of the site. Coastalwatch features included were swell forecasting, beach snapshots and one-click live viewing of Newport Beach. Newport Board Riders major funding comes from sponsorship so we did a photoshoot with major Newportplusboardriders.com sponsor, Peak, and gave them prime positioning on the website’s background. Along with this, all the businesses’ that sponsor the club have their logo rotating at the bottom of the website. One of Australia’s biggest off-road motorcycle performance parts and accessories companies, Ballard’s Offroad wanted to begin selling products online. Starting off small and minimising upfront costs, a gift certificate system was devised using Paypal as the payment gateway. 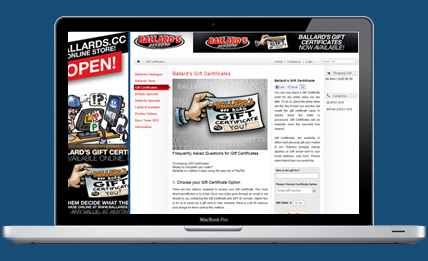 The automated system emails customer’s their gift certificate once payment has been made, otherwise customer details are sent to Ballard’s directly for manual processing. To help reduce problems, all transactions are logged via Paypal and in an internal database system, which Ballard’s has full access to. 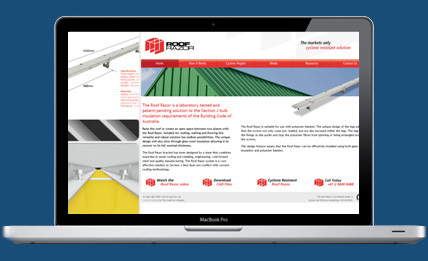 Roofing specialists, RoofRazor, already had a developed static website but were looking to easily update the content on their website without having to use a third party. We selected and installed a package that would meet their needs, within their budget. 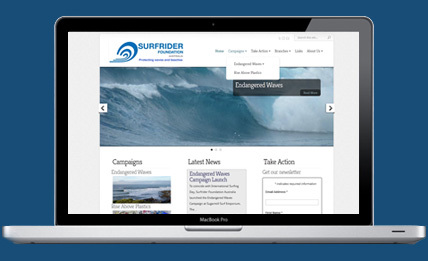 National not-for-profit coastal protection charity, Surfrider Foundation Australia, are enhancing their management systems and creating a centralised database with stakeholder information. Built using Access, the database holds stakeholder records, keeps track of payments, and creates an abundance of reports to help manage the charity’s resources. Along with designing and developing the database, minor enhancements to their website’s aesthetics were made. Employed full time at off-road motorcycle company, Transmoto Dirt Bike Magazine, I initially came on-board when the magazine first launched as an Online Content Manager. Over time the role grew into a Web Editor position, which included tasks like Journalist, Videographer, Photographer, Web Designer and Developer and I had key input into online marketing strategies. Working closely with a small team, there were no barriers to enhancing my skills and, on occasion, my work was published in the magazine. 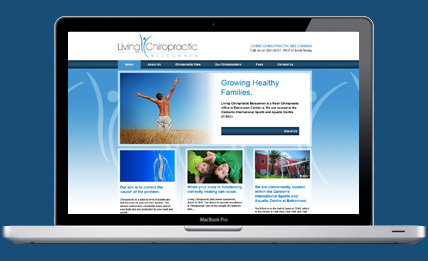 Canberra-based chiropractors, Living Chiropractic Belconnen, were after a professional website where clients could find information about their business and get in contact with them. My roles were to liaison with the client and build the website to specification based on Benjamin Tuffy’s design. 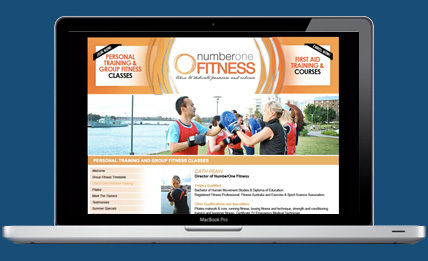 Sydney Personal Trainer, Cath Feain, needed a smart professional website for her training business, NumberOne Fitness. WordPress was chosen to drive the system because the client wanted to be able to update the content and expand the website in the future, while social media was incorporated to increase user interactivity. Designed by Benjamin Tuffy, a new WordPress theme was created and modified to meet the design specifications. 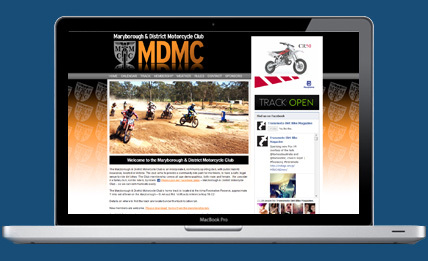 Victorian motocross club, Maryborough Motorcycle Club, required a state-of-the-art modern website to keep club members and riders informed about up-and-coming event, news, membership details and provide a way for the club to be contacted. 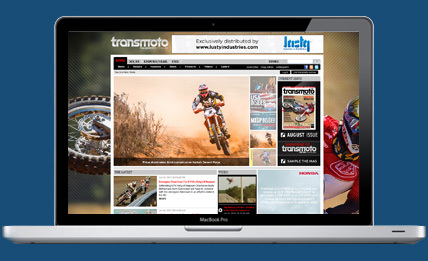 Transmoto staffer, Phil Osborn, supports the club and Transmoto had their Facebook and advertising incorporated into the design to boost up the website’s profile. Other third party technology used included Google Maps. The club has full control over the content for the website. Owned by acclaimed Record Producer, Scott Horscroft, Archangelsky Music sees some of the best artists come through their doors, including Ballarat’s up-and-coming artist, Gold Fields, Triple J Unearthed competition winners, Millions, and Indie Punk band, Bleeding Knees Club. The website is static and incorporates the company’s producers and artists. 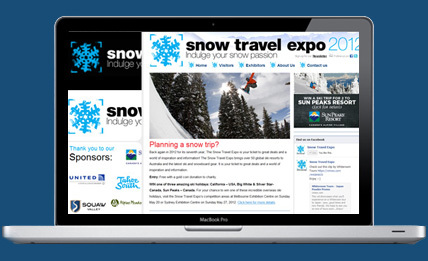 It utilises their Twitter feed to help portray the latest news to visitors, as well as a Facebook Like button. 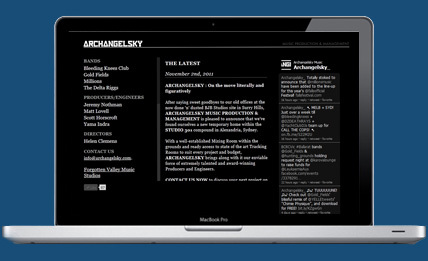 Linked to a basic content management system, Archangelsky can update the website’s content through an online interface. 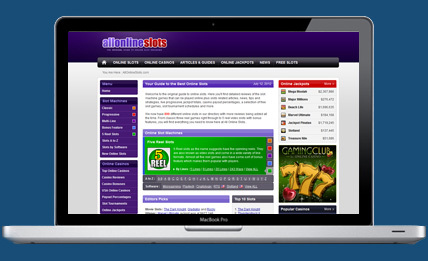 USA-based online gaming company, All Online Slots, wanted to create an online jackpot database from multiple sources. A daily automated script was created that pulls information from XML, RSS and text files, then converts it to the required format for storage in the extensive jackpot database. An output script was devised and total control of the format and information is placed in the client’s hands. 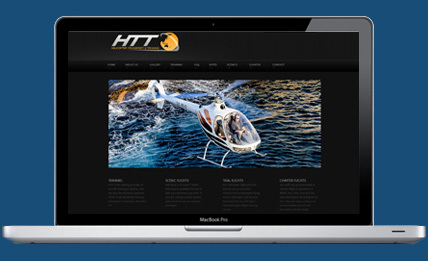 Pre-existing helicopter transport and training website, Helipad.com.au, were seeking a way to update the website themselves. The design stayed the same however the content was reviewed and modifications were made to present the information in a professional manner. WordPress was used to allow the client to modify the website’s content. 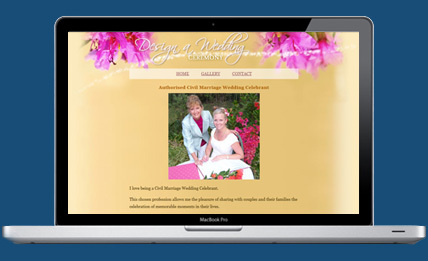 Port Macquarie Marriage Celebrant, Angie Jackson, was after a friendly, sleek website that would feel warm and friendly for visitors and invite them to contact her for more information. A beautiful design was constructed and a gallery of ceremonies were used to portray those emotions. Angie Jackson recognised that being found on the web was very important to her business so an SEO strategy was formulated and is being routinely reviewed. Port Macquarie dive specialist, Rick Anderson, required regular updates to his website. 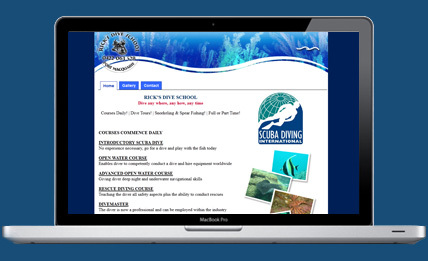 Involving multiple galleries, videos and a contact page, new content is updated every dive season. A website is only as good as the number of people looking at it. Making sure you maximise your reach ensures your website continues doing its job: to sell. We have a number of SEO packages that will reach your target market and make sure you’re being seen by the people who count; from entry level packages for businesses who don’t want to spend a fortune for results, to those who want to start a full blown online marketing campaign. Around the world, the smartphone market has grown by four since 2010, while mobile internet usage in Australia doubled. And this year, smartphone sales have almost tripled the PC market. With those kinds of statistics the online mobile market shouldn’t be ignored. 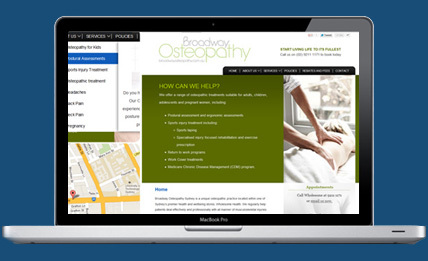 Be proactive and get a mobile website optimised for iPhone and Android smartphones. Find out more about our mobile websites. Blue Liquid Designs is a web development company who specialised in WordPress plugin development. Our most notable software is Gravity PDF.